guoyunhe added a comment to D19812: Add a web page to view and compare icons of different sizes. guoyunhe committed R883:1539481: Crowdin Sync [kf5-trunk] [zh_CN]. guoyunhe committed R883:1539480: Crowdin Sync [kf5-stable] [zh_CN]. guoyunhe updated the diff for D19812: Add a web page to view and compare icons of different sizes. I'm not a fan of how it dumps all this stuff in the source directory. Ideally it would put everything to the build directory when doing an out-of-source build so the source dir isn't cluttered up with transient and rapidly-changing information. Then you also wouldn't need to add these files to gitignore. Could you use #eff0f1 and #31363b for the light and dark backgrounds since those are the colors we normally use for window backgrounds? Are you able to test this yourself? I assume this fetches the icons from your local system? I'd like to see this run as part of the build process, so that index.html gets updated automatically, and so running it doesn't pollute your source folder since you're of course doing out-of-source builds :) Then you don't have to add the generated text files to .gitignore. guoyunhe added a reviewer for D19812: Add a web page to view and compare icons of different sizes: Breeze. guoyunhe requested review of D19812: Add a web page to view and compare icons of different sizes. guoyunhe added a comment to D17469: Give applications-games and input-gaming more contrast with Breeze Dark. guoyunhe requested review of D19689: Add Simplified Chinese (zh_CN) language selector option. guoyunhe committed R883:1536812: Crowdin Sync [kf5-trunk] [zh_CN]. guoyunhe committed R883:1536813: Crowdin Sync [kf5-stable] [zh_CN]. 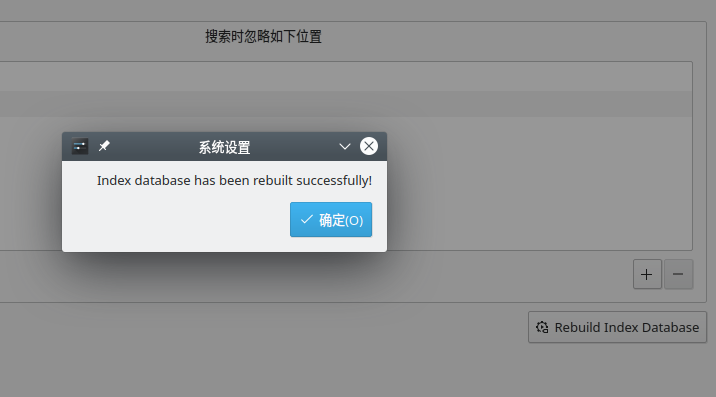 guoyunhe added a comment to D18890: Add button to reset index database and repair Baloo crashing. If we know the DB is corrupted, and it's just a cache, why do we need a user facing button? maybe also add an heuristic that if has been automatically rebuilt more than x times in the last y time, stop doing it? guoyunhe committed R883:1535857: Crowdin Sync [kf5-trunk] [zh_CN]. guoyunhe committed R883:1535856: Crowdin Sync [kf5-stable] [zh_CN]. guoyunhe added inline comments to D18890: Add button to reset index database and repair Baloo crashing. guoyunhe updated the diff for D18890: Add button to reset index database and repair Baloo crashing. Great! Just one more UI suggestion: use the string "Rebuild Index Database"
I wish this weren't necessary, but I think it's a good idea for the time being. Can you reduce the button width so it doesn't span the entire layout? It should be as small as possible and right-aligned. guoyunhe added a project to D18890: Add button to reset index database and repair Baloo crashing: Baloo. guoyunhe added reviewers for D18890: Add button to reset index database and repair Baloo crashing: Plasma, Baloo. guoyunhe requested review of D18890: Add button to reset index database and repair Baloo crashing. guoyunhe committed R883:1533980: Crowdin Sync [kf5-stable] [zh_CN]. guoyunhe committed R883:1533979: Crowdin Sync [kf5-trunk] [zh_CN]. guoyunhe committed R883:1532189: Crowdin Sync [kf5-stable] [zh_CN]. guoyunhe committed R883:1532188: Crowdin Sync [kf5-trunk] [zh_CN]. guoyunhe committed R883:1531536: Crowdin Sync [kf5-stable] [zh_CN]. guoyunhe committed R883:1531535: Crowdin Sync [kf5-trunk] [zh_CN]. guoyunhe updated the diff for D17773: Copy to Clipboard in English. Hide the "Copy to Clipboard in English" button when the system is already in English. guoyunhe added a comment to D17704: Copy to clipboard always copy English texts. guoyunhe added a reviewer for D17773: Copy to Clipboard in English: Plasma. guoyunhe requested review of D17773: Copy to Clipboard in English. I recall in the original patch that copying translated text was something that various folks specifically asked for. Is it really that useless? @gregormi, do you remember the context? guoyunhe updated the diff for D17704: Copy to clipboard always copy English texts. If I understand your patch correctly, you only forbid translating the order of text, not the actual text labels. guoyunhe added a reviewer for D17704: Copy to clipboard always copy English texts: Plasma. guoyunhe requested review of D17704: Copy to clipboard always copy English texts. guoyunhe committed R883:1530541: Crowdin Sync [kf5-stable] [zh_CN]. guoyunhe committed R883:1530540: Crowdin Sync [kf5-trunk] [zh_CN]. guoyunhe updated the diff for D17469: Give applications-games and input-gaming more contrast with Breeze Dark. guoyunhe added a reviewer for D17469: Give applications-games and input-gaming more contrast with Breeze Dark: Breeze. guoyunhe requested review of D17469: Give applications-games and input-gaming more contrast with Breeze Dark. guoyunhe requested review of D17246: Unify height of message editor and nickname selector. guoyunhe committed R883:1528221: Crowdin Sync [kf5-stable] [zh_CN]. guoyunhe committed R883:1528220: Crowdin Sync [kf5-trunk] [zh_CN]. guoyunhe requested review of D16734: HiDPI: make icons sharp and smooth. guoyunhe committed R883:1527603: Crowdin Sync [kf5-stable] [zh_CN]. guoyunhe committed R883:1527601: Crowdin Sync [kf5-trunk] [zh_CN]. guoyunhe committed R883:1526241: Crowdin Sync [kf5-stable] [zh_CN]. guoyunhe committed R883:1526240: Crowdin Sync [kf5-trunk] [zh_CN]. guoyunhe committed R883:1525461: Crowdin Sync [kf5-stable] [zh_CN]. guoyunhe committed R883:1525460: Crowdin Sync [kf5-trunk] [zh_CN]. guoyunhe committed R883:1525026: Crowdin Sync [kf5-stable] [zh_CN]. guoyunhe committed R883:1525025: Crowdin Sync [kf5-trunk] [zh_CN]. guoyunhe committed R883:1524520: Crowdin Sync [kf5-stable] [zh_CN]. guoyunhe committed R883:1524519: Crowdin Sync [kf5-trunk] [zh_CN]. guoyunhe committed R883:1524518: Crowdin Sync [kf5-trunk] [zh_CN]. guoyunhe committed R883:1523776: Crowdin Sync [kf5-stable] [zh_CN]. guoyunhe committed R883:1523775: Crowdin Sync [kf5-trunk] [zh_CN]. guoyunhe updated the diff for D14992: Crowdin localization workflow. guoyunhe added a comment to D14342: KDE SVN synchronize script. guoyunhe requested review of D14992: Crowdin localization workflow. guoyunhe committed R883:1523002: Crowdin Sync [kf5-stable] [zh_CN]. guoyunhe committed R883:1523001: Crowdin Sync [kf5-trunk] [zh_CN]. @ltoscano Do you know where is the script that handles StaticMessages.sh? I want to try if the script can be modified to support multiple pot files. Sorry, I totally forgot that we already discussed this and that StaticMessages.sh only create one file for repository. The other solution would be helping us to extend the code which calls StaticMessages.sh to support more po files. What worries me a bit is that this checks out the entire svn tree which is huge. Couldn't we make a list of languages that have manual translations, and only checkout out what we need? guoyunhe updated the summary of D14342: KDE SVN synchronize script. guoyunhe requested review of D14342: KDE SVN synchronize script. guoyunhe committed R883:1520846: Update Krita document translation templates. guoyunhe committed R883:1520835: Crowdin Sync [kf5-stable] [zh_CN]. guoyunhe committed R883:1520834: Crowdin Sync [kf5-trunk] [zh_CN]. guoyunhe committed R883:1520833: Update Krita Document templates. guoyunhe committed R883:1519171: Crowdin Sync [kf5-stable] [zh_CN]. guoyunhe committed R883:1519170: Crowdin Sync [kf5-trunk] [zh_CN]. guoyunhe committed R883:1518785: Crowdin Sync [kf5-stable] [zh_CN].